RobinGoodfellow SoapWorks is all about basic hand-crafted artisanal soaps. I started making them thanks to my own sensitive skin because I needed a reliable product that wouldn't dry me out or leave me itchy - one that didn't include dyes or artificial fragrances. And, frankly, I just like making stuff for myself. That way, I know what's in what I'm putting on my skin. I also started giving the soap to friends for holiday presents and the like, and they all kept saying, "You should sell this!" It wasn't anything I planned. After all, it's just soap and not particularly pretty looking soap at that. But I needed some quick cash, so I starting selling it, first at a couple shows, then at one of my fave stores, Hoopla! It's run by my friends Lori and Scott Webster. And people really like the soap, which means Lori spends a lot of time asking me to get her more. Hey, I didn't know that it was going to be that popular. 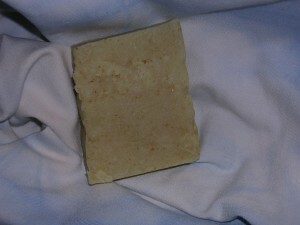 All the bars are made with olive and coconut oils, and with oatmeal to nourish and gently exfoliate. Add some luscious essential oil (lavender, eucalyptus, peppermint or orange) to relax or energize you and you've got the perfect way to clean up. They may not look like much, but that's because they are meant to be used. Seriously, this is soap with a job to do. So please don't leave your bars in a basket on the back of your toilet. It makes them sad. Each bar costs $7 for 5 ounces of good, clean fun! Hoopla! is at 2591 N. Fair Oaks Ave., Altadena, CA 91001, 626-797-1135. Or email Lori at ShopAtHoopla.gmail.com.